When it comes to enhancing your toddler’s imaginary playtime and getting them more engaged, the best car toys for 3 year olds can help immensely! They’ll help your child to go on all kinds of awesome adventures, including pretending to be a police officer, a super hero, a famous race car driver, and much more! Toddlers love toys that move and make noises and your three year old is no exception. They also love brightly colored toys as they captivate them and hold their attention for longer. And each toy car on our list offers your child something fun and unique. After in-depth research, we’ll pulled together our list of the best toy cars for your 3 year old to enjoy playing with, all of which meet our very strict selection criteria so that you can shop with confidence and peace of mind. This gorgeous Cartoon Remote Control Race Car is the perfect first rc car for your 3 year old toddler as it’s colorful, compact, and comes with sounds, music and lights. Your child will receive the race car itself complete with a driver figure and the remote control which is in the shape of a steering wheel for more realistic play. 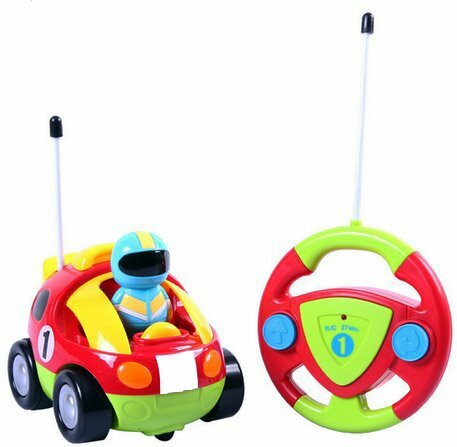 The bright yellow and red colors will capture your toddler’s attention as they eagerly look to learn how to control the car. There are 3 push buttons on the car itself; one for music located behind the driver on the car, one for cool sounds that’s located on the driver’s helmet, and one on the steering wheel that makes an engine sound. The steering wheel remote control has 3 buttons also; one for making the car go forward, one for making the car go backwards, and one to turn on a light. Your little one will have tons of fun with this super cute race car, maneuvering it around the kitchen, the legs of the chairs and tables, and all kinds of other obstacles in it’s path! They can remove the race car driver if they want to and give him a break from driving all those tough races and play with him seperately. If your three year old’s siblings or toddler friends have a similar rc car, then they can race against each other for even more fun and excitement. The highest quality ABS plastic has been used to make this car toy and it has been safety tested for kids. Several parents shared that their 3 year old had no problem mastering the controls and loved watching the car go at lightning speed across the floor! Kids have great fun making this car race superfast across the floor! Encourages your child to engaging in imaginative and pretend play as they zoom around the ‘track’! Goes at a really great speed! 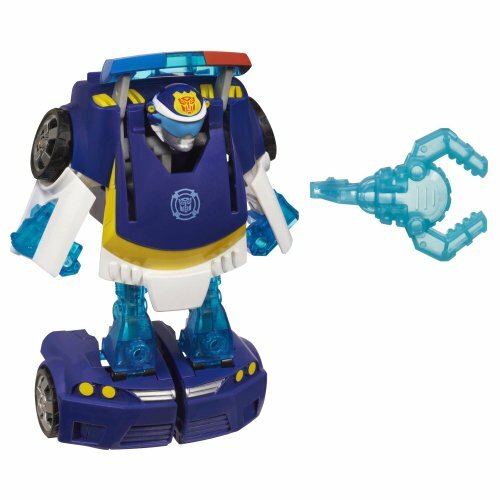 If you’d like to give your 3 year old a really special car toy then look no further than the Playskool Heroes Transformers Rescue Bots Energize Chase the Police-Bot Figure which is an amazing police car and transformer all in one! Your toddler can change this police bot car from a vechicle to a really cool robot transformer and back again! A cool figure is include to make play more realistic as your child can create their very own stories and adventures while they fight crime, chase baddies and outsmart thieves! There is also a rescue claw included that your little one can attach to the hood of the car or can have the robot transformer hold it. This is a perfect size for three year olds and changing from vehicle to robot mode and back again is easy for them to do. Your toddler can move the car and the transformer for more imaginative and engaging play and can play on various surfaces, both indoors and outdoors. There are no small pieces which parents really like and several shared that their kids absolutely love this toy and play with it for hours on end. Perfect for independent and active play and for keeping your child entertained on long car journeys or at restaurants. Exciting 2-in-1 toy that kids have great fun with and enjoy playing with! One of the coolest toy car gifts for three year olds is the super cute Just Play PJ Masks Vehicle Cat Boy and Cat Car which toddlers absolutely love! Your child will get the Cat Boy figure which is 3″ high and the special Cat Car that Cat Boy uses to save the day! 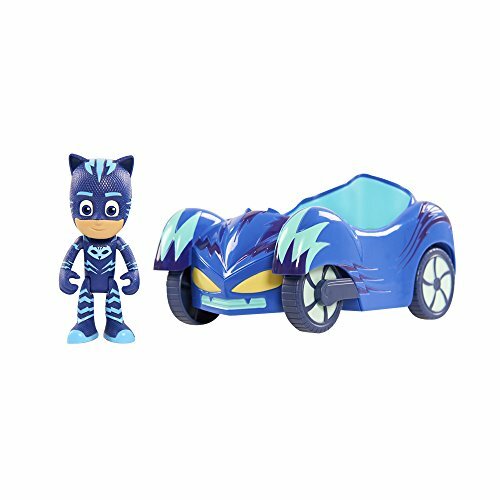 Cat Boy fits into the vehicle and there are 2 other spaces for the other PJ Masks figures – Owlette and Gekko is your toddler collects them. The figure is poseable which make play more realistic for your child, as they create all kinds of scenarios where Cat Boy drives in his car and rushes to save the day! A fantastic toy for imaginative and storytelling play, your toddler can play with it independently or with siblings or toddler friends for even more fun. And if their siblings or friends have the Owlette and Gekko playsets, then all of them playing together can create all kinds of adventures that will keep them occupied and having fun for several hours! A number of parents shared that this car toy set is adorable, it’s a very nice size, wheels work really well, and their kids absolutely love it! Some even bought all 3 sets so their kids could have even more fun! Kids have fantastic fun playing imaginary hero scenarios with Cat Boy and his cool car! Allows your child to create their own fantastic stories of all kinds of Cat Boy adventures! 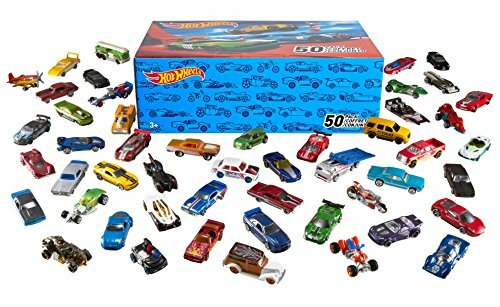 If your 3 year old is obsessed with cars, then they’re going to love the huge selection of really cool toy cars in the Hot Wheels Basic Car 50-Pack! Each car has realistic details and comes individually packaged so you can gift some of them to other siblings or toddler friends if you like. The designs reflect classic cars and new car models and your little one will enjoy pushing them and watching them go at speed for hours of fun! This is a fantastic set for your toddler to enjoy playing with their siblings or friends where they can select different cars and race against each other to see whose car is the fastest! They can also create their own track and obstacles to race the cars around for even more fun! Hot Wheels have been making car toys for over 45 years so you know that their products are top class given how long the company has lasted. Several parents shared that their three year old loved these cars and that the set was well worth buying. Kids have fantastic fun racing these cars with their friends and siblings! 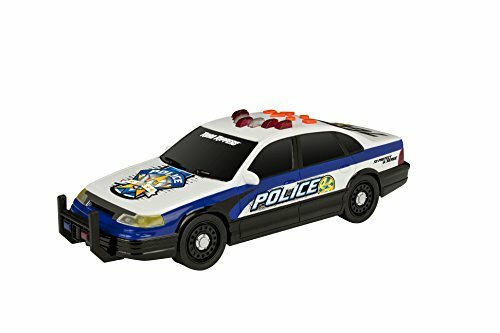 If you have 3 year old twins who love cars, then the Prextex Pack of 2 Cartoon R/C Police Car and Race Car is the perfect toy for them! What your little ones will get is a police car with two policeman figures and a race car with two racing driver figures. Each car comes with its own remote control in the shape of a steering wheel which your kids will love as it will make them feel like they’re driving a real car! The cars have lights and sounds and the police car has a realistic siren sound which will amuse your toddlers. Your children can remove the figures from the cars and play with them independently if they like. 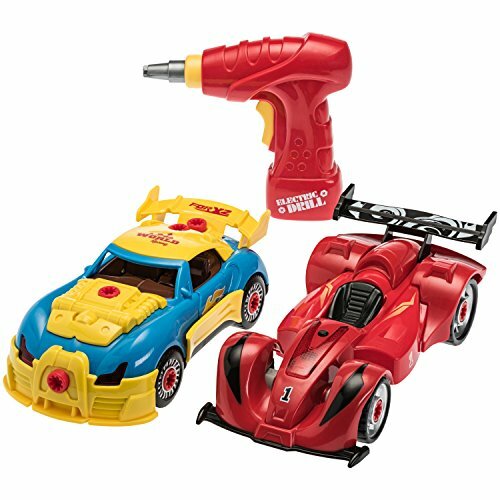 The fantastic thing about this car toy set is that your kids can race the cars against each other because they operate on different frequencies. Each remote control has 3 buttons; one to move the car forwards, one to move the car backwards and one to turn on lights. There are push buttons on each cars for sounds and one of those buttons plays music which will keep your child entertained. The cars take 3AAA batteries and the remote controls take 2AA batteries, none of which are included. A number of parents shared that their kids love this car set and enjoy chasing each other’s car around! Some parents mentioned that they love playing them themselves so they can race against their three year old! Kids have a ton of fun racing these cars against each other and having the police car chase the race driver! Kids love the steering wheel remote control as they feel they’re actually driving! If your 3 year old is inquisitive, loves to take things apart to see how they work, then they are going to love the Think Gizmos Take Apart Toy Racing Car Kit! This car toy kit allows your child to build their own car and then take it apart again! There are 30 pieces in total in this car making kit, including, the engine, the roof, the hood, the front bumper, the side bumpers, the spoiler, the seats, the tyres, the screws, the drill bits and the drill. It also comes with batteries and then the engine is turned on, your toddler will sounds and lights for more realistic play. The back of the box has a detailed diagram explaining how the parts go together, but your little one can create their own model too if they’d prefer. 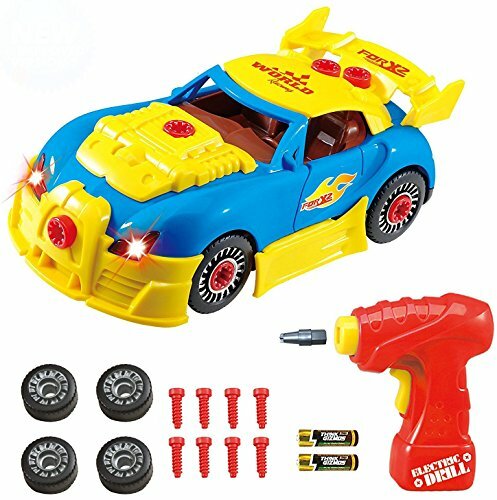 This is a wonderful construction and educational toy for your child and they will have super fun working the drill like a real mechanic, creating their very own race car! Several parents shared that their three year old absolutely loved this toy car making kit and had great fun putting the car together, taking it apart, creating their own style of car and more! Kids have terrific fun putting this car together with the drill, taking it apart, making their own car and more! Encourages your child to role play, pretending to be a mechanic looking after their own race car and more! If your three year old loves playing with toy cars then they are going to love this Melissa & Doug Service Station Parking Garage! This interactive toy comes with 2 wooden toy cars, a working elevator, a car wash with a moveable belt, a gas pump and sliding garage doors. Your child will get one red car and one blue car and the entire service station has a nice handle so they can take the whole toy with them. The parking areas are numbered, just like a real parking garage, so your child can reverse park or forward park their car into any space they choose. On arrival at the service station, they can pretend to fill up their car with gas and opt to put the car through the car wash to get rid of any dirt following their long pretend journey! Once they’re done, the can put the car on the elevator and go to the rooftop to park in their chose numbered space, having driven through the barrier that moves up and down. While your toddler can certainly have tremendous fun playing with this Melissa & Doug Car Service Station on their own, given there are two cars, it will be even more fun for them to play with a toddler friend or sibling. A number of parents shared that their 3 year old plays with this service station for hours on end, that the toy is solidly built and holds up well to rough play, and that it’s a really awesome toy. Kids just love this fantastic service station with cars, car wash, elevator and more and have great fun playing with it! Hose from gas pump will fit into each car so your child feels they’re really pumping gas! If you’re looking for a wonderful interactive car toy playset for your 3 year old, then you’ve got to check out this amazon Matchbox Mission 4-Level Garage Playset that your toddler will love! Your child will get a 4-level parking garage with a spiral ramp, a working elevator, working gates, and a tow truck. There is a car wash for your toddler can ‘clean’ the vehicles and a service station where their pretend customers can get their cars serviced and fixed. Your little one can use the tow truck to bring cars that have broken down in their imaginary stories to the service station to get repaired. There’s lot of wonderful detail in this playset, such as gas pumps so your three year old’s ‘customers’ can fill up their gas tanks. Also, there are pretend tools for fixing the cars and so much more! Your child can use any Matchbox cars or Hot Wheels with this set and role play at running a very busy garage! 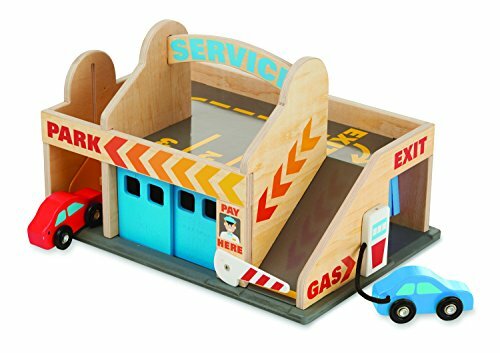 Lots of parents shared that this is a wonderful garage playset that’s perfect for Matchbox vehicles and their toddler had hours of fun play with it. Some parents also mentioned that it brought back fond memories of the time when they played with a similar set as a child and so they were delighted to find this set for their own kids. Kids love playing with this gorgeous car garage playset and have great fun! Comes with a tow truck so your toddler can tow ‘broken down’ cars to their garage! 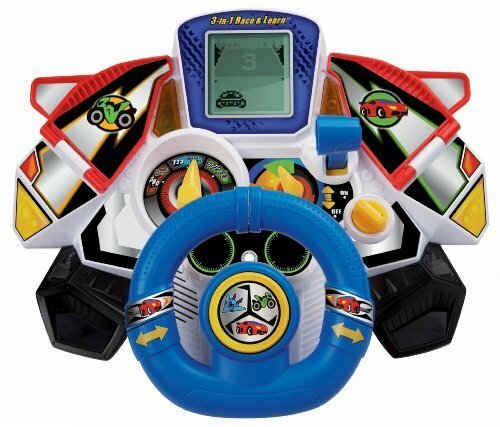 If you’re looking for a car toy with a difference and something extra special for your 3 year old, then have a look at the VTech 3-in-1 Race and Learn toy which is basically 3 toys in one! There are 3 ways your child can play with it – as a race car, as a motorcycle or as an airplane! Basically, the steering wheels can be transformed into the correct type of steering for any of those three vehicles making it very versatile and more interesting for your toddler to play with. It has a LCD screen that has nine different courses for your child to race on and the controller has vibrartion effects to make play more realistic. When your little one changes gear, they will hear real racing sounds to enhance their pretend play experience. While this toy is super fun, it is also very educational as your toddler will learn their letters, numbers, spelling, and much more! It does have a volume control and an automatic shut off when it’s been left idle for a while. This is a fantastic toy for encouraging your child to let their imagination soar as they move from pretending to be a race car driver to being a motorcycle dispatch rider to a pilot flying over the oceans! A number of parents shared that their toddler absolutely loved this 3-in-1 toy because it makes sounds, vibrates and makes the feel like they are really driving! Kids have tons of fun with this 3-in-1 toy and play with it for hours on end! Vibrates for added effect so they feel like they are really driving or flying! This gorgeous Toy Truck Transport Car Carrier With 6 Toy Cars is the perfect gift for any 3 year old that loves playing with toy vehicles. 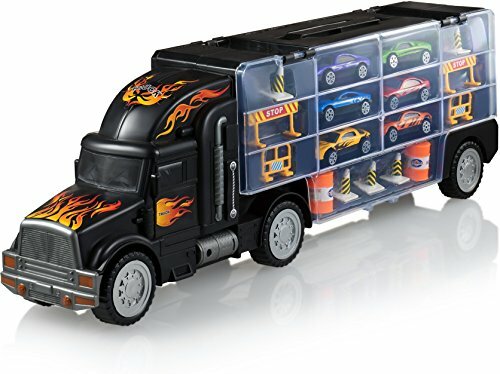 Your child will get a large truck with 28 slots on both sides of the trailer for storing car toys, 14 slots on each side. They will also get 6 toy cars and some accessories such as construction road signs, construction cones and more. The cab is detachable which makes for more engaging play, and it turns quite easily. This will allow your child to create their very own storytelling adventures, hooking up the trailer, loading up cars, driving off and more! There is a handle on the trailer so your toddler can carry the truck, even with the cars inside and this handle is detachable. The entire car carrier is 20″ long x 7.2″ high x 3.5″ wide, which is a decent size for toddlers to play with. While your little one can load and unload the six cars that come with the car carrier, they can also load up any other toy cars they have, which makes for even more fun. Toddlers love toys that they can open, put things in, take things out, as it just seems to fascinate them! So if your three year old loves doing this and also loves toy cars, then this is the perfect toy for them! A number of parents shared that their toddler loved this toy car carrier and really engaged in pretend play with it, setting up roadblocks, roadworks, and creating their very own storytelling adventures! Kids have wonderful fun playing with this toy car carrier, loading and unloading cars and more! The KidKraft Mega Ramp Racing Set is a fantastic interactive playset for your 3 year old child to race their toy cars on! 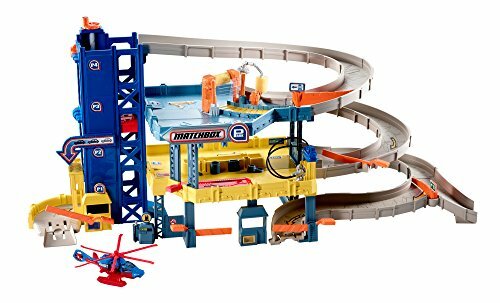 There are 3 levels in this playset and your toddler can use the launch pad to race their toy cars against each other to see which one is fastest. This is even more fun if they play with a sibling or toddler friend and introduces them to friendly competitiveness. The car toy playset has a parking garage with a moving elevator to take pretend passengers to the top of the garage. Your little one will be fascinated with the helipad and helicopter on the roof of the parking garage. Also included are gas pumps so they can pretend to fuel up their toy cars, a car wash to pretend to keep their cars free from dirt and grime, a spiral ramp and 3 lights to announce the start of a race – red, amber and green. Included with the racing playset are five toy cars, but your child can also use their own cars we well, especially hot wheels, matchbox and others. Imagine the fun your child will have playing with this ramp racing playset, bringing cars up the elevator to park them, putting some of them through the pretend car wash, racing cars down the ramp and so much more! The set is super easy to put together which is something parents quite like and several parents shared that their kids play with it for hours. 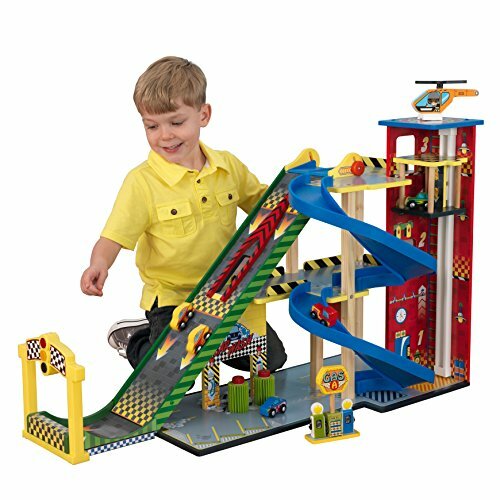 Kids have loads of fun playing with this super mega ramp racing set, racing cars against each other and more! 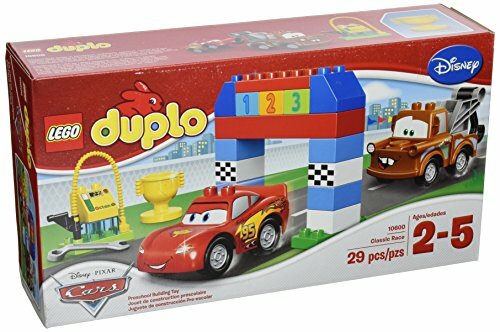 For three year olds that love to build things as well as play with toy vehicles, this LEGO DUPLO Disney Pixar Cars Classic Race 10600 is the perfect choice! Your child will get the popular Lightning McQueen and Mater car toy figures as well as a wonderful selection of colorful block to build their own race starting line. Included on the blocks are a chequered flag and the finishing position 1, 2 and 3 so your child can create their very own winner’s podium where they can present the winner with the Piston cup which is included. They can have the two fun cars race each other to see which one wins! Along the way, they can have them pull in at the pit stop to fill up on fuel using the gas pump that comes with the set, and do any repairs needed with the wrench that’s included. The big bricks are the perfect size for small toddler hands and your little one will have great fun creating their own racing adventures and stories. Several parents shared that they love this LEGO set and that’s it great for teaching their 3 year old how to put things together. They also mentioned that it makes a wonderful gift for any young car fan and is very durable and simple to make. Kids have terrific fun with Lightning McQueen and Mater, building their own podium, pit stop and more! If your 3 year old toddler is the creative type that loves cars and vehicles of all kinds, then they are going to love the Prextex 4 in 1 Build Your Own Racer Car Set as it allows them to express be creative while building their very own race car! Your child will get a real working drill and 53 take apart pieces that will allow your little one to create 4 different styles and models of race cars! When they finish putting the cars together, they will end up with one blue car, one blue and yellow car, and 2 solid red cars to play with. They can take them apart again and start all over for even more fun! All of the parts needed are included, from bumpers to tires, hoods, roofs, engines and screws, and so much more! This is a very interactive car toy set and it will keep your three year old happily engaged and entertained for several hours! They will love the fact that the toy drill makes real sounds and lights up! When they have finished making the cars, they can play with them indoors or outdoors, racing them against each other to see which one is the fastest. A number of parents shared that this race car builder toy set was a huge hit with their kids and they were so excited to receive it. They mentioned that for some of them, they were able to pretend play running their own garage, fixing up cars for pretend customers. Kids just love building these race cars and playing with them afterwards as they have great fun! Great for encouraging your child to engage in imaginary play as they pretend to be a garage owner and more! Three year old kids love vehicles of all shapes and sizes but one of their absolute favorites is of course the Toy State 14″ Rush And Rescue Police Car as it allows them to really engage in pretend play. 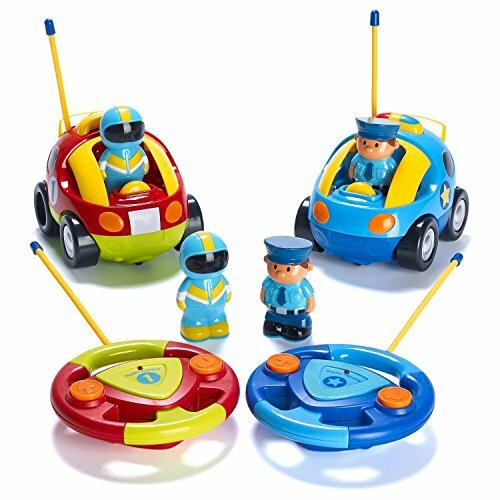 This toy police car has been designed to closely resemble a real police car and it comes with engine and rescue sounds, music, phrases and more! Your toddler will have great fun creating their own police and rescue adventures, where they save the day and get to feel like a real hero. It operates using 3 AA batteries which are included and it has a motorized forward drive. Safety tested and non-toxic, this is a great toy car for your little one’s collection as they can combine it with their other toy vehices and action figures to create great storytelling fun. Several parents shared that their toddler’s eye’s lit up when they first saw this toy police car and they played with it for hours. They also mentioned that it is very well made, durable and quite sturdy. Kids have great fun pretending to be a police office fighting crime when playing with this toy car! 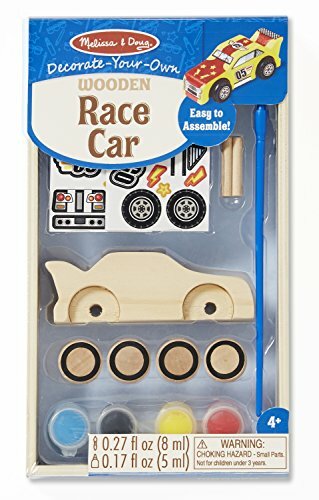 If your three year old love to build their own toy car, then this Melissa & Doug Decorate-Your-Own Wooden Race Car Craft Kit is the perfect toy for them! Made from solid wood, it is 4 inches long and comes with axles, wheels, paints, paintbrush, and stickers so not only can your child put the car together, but they can also decorate it any way they would like afterwards! Young kids love stickers so your child will not be disappointed as there are a total of 25 stickers in this car craft kit. They all get 4 pots of paint giving them some nice colors to choose from when decorating their wooden toy car. When they have put the car together, it will work properly as the wheels will turn when they push it. This is a wonderful craft kit for any child that loves crafts as well as vehicles because it combines the two. A number of parents shared that their kids absolutely love this car toy craft kid and had a blast putting it together and painting it afterwards. Kids have fantastic fun making the car first, painting it and decorating it and then playing with it!